As we know that when we create an application by using MVC, it always a burden to us to create the view more interactive. 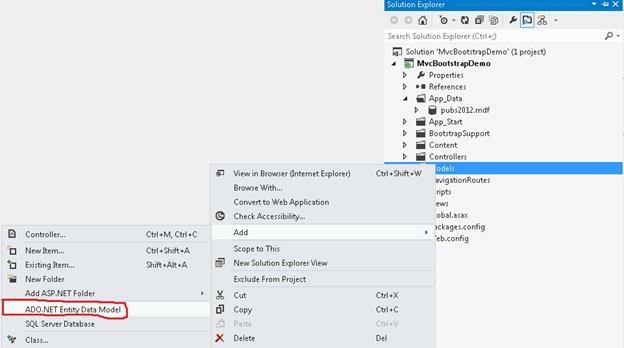 As we can't use any server side controls, not any of the ASP.Net controls, no Grid View, No View state also etc. So it's quite difficult to create an interactive view just by using the simple HTML controls. 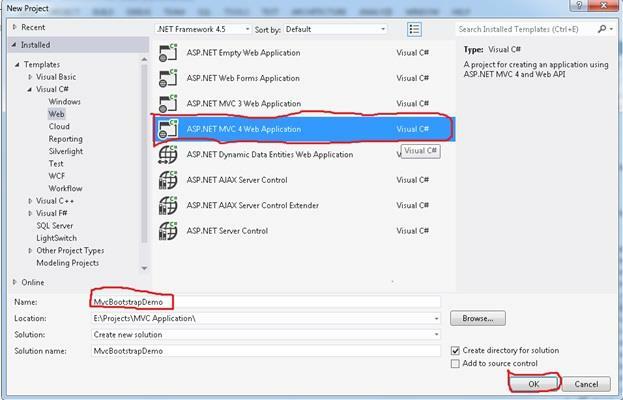 So here we will see that how we can use the Twitter Bootstrap in our ASP.Net MVC 4 application. 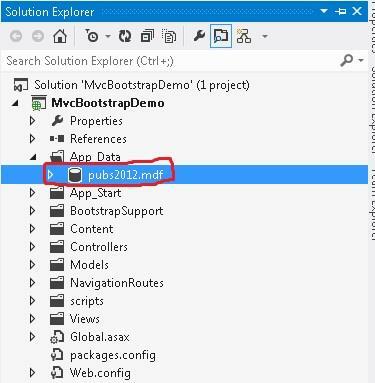 The demonstration will be using the Visual Studio 2012 with ASP.Net MVC 4. 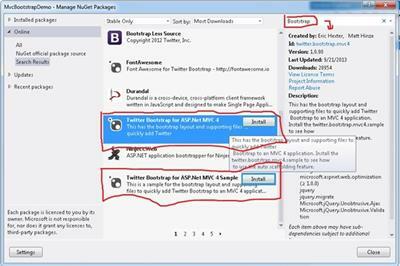 Question: What is Twitter Boot Strap? And Why Bootstrap? Twitter Bootstrap is a 3rd arty utility to design the MVC Razor pages so that the View should look more interactive. We as a developer need not to worry about the styles, fonts, width etc. All these things will be taken care by the Bootstrap. 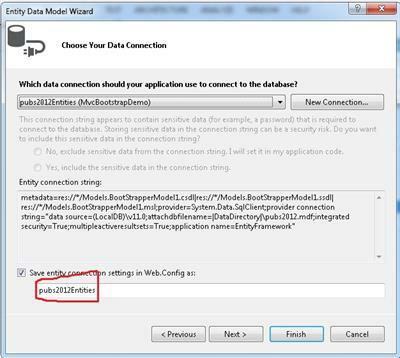 So it's an utility which can be embed in to our application like in MVC 4 application to make our job more simple. Step#3:Choose the Empty template from the template list. As we are using Razor engine for our view so make it default as Razor for the View Engine. Press OK. Install both the utilities by clicking the install button for each of them. 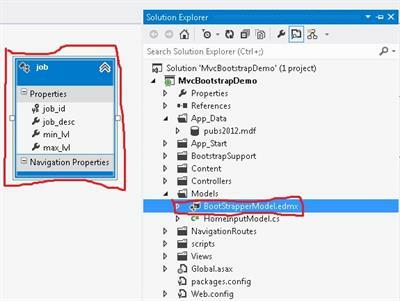 Step#6: Once the installation will complete, go to solution explorer and check for the additional folder for the Bootstrap. 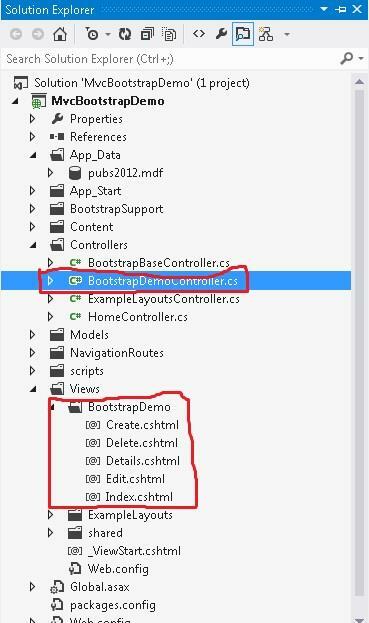 If we can see the folder name ‘Bootstrap Support’, it means the bootstrap is installed successfully. And we can start our application development. Step#13: Choose the entities you want to work with. Like table, views, stored procedure etc. Let’s say I select a table name called Jobs from the table list. Click on the Finish Button. Step #14:A new model gets generated with all the properties. So our Model is ready now. 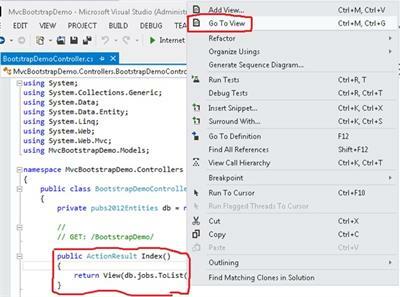 •	Here we need to choose the scaffolding option as- Mvc Controller with Read/Write actions and views,using Entity Framework. Step #16:Automatically the Controller with all the actions(CRUD operations) and all the views for these operations will be generated. We can check the controller lass and the views in the Views folder. 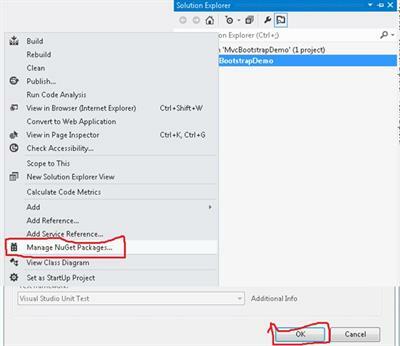 Step #17:Go to the Index action method of the controller and right click inside the action method and click on Go To View. It will open the Index view. 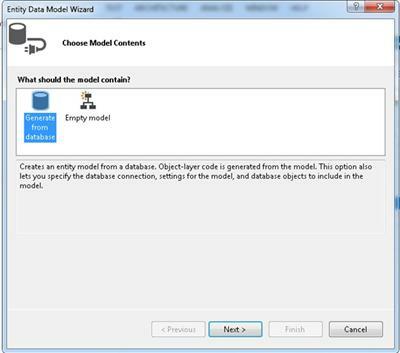 Step#19: In the similar way, go to the Create, Edit, Delete and Details View and modify the View code to display the contents in a table. So the layout will be added from the above path. Step#21: Run the application and call the controller. By default it will call the Index action method as per the routing mechanism. 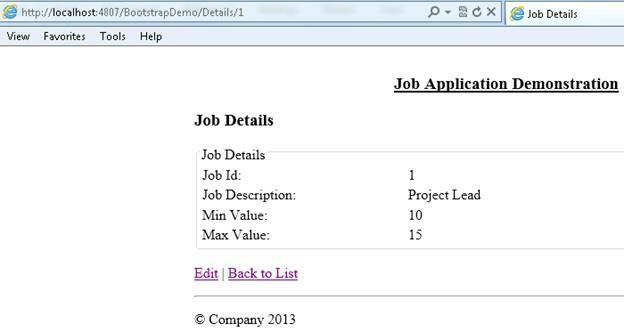 Step#22: Click on Add Job link and add a new job and click on Createbutton. A new job gets saved to the database. 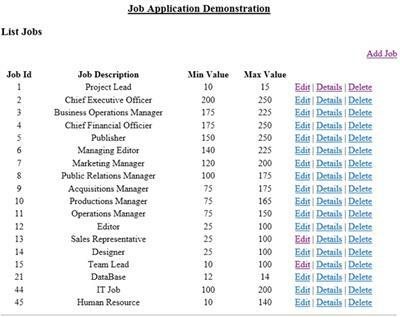 Step#23: Click on Edit link, it will take the user to the Edit.cshtml view to edit the job. 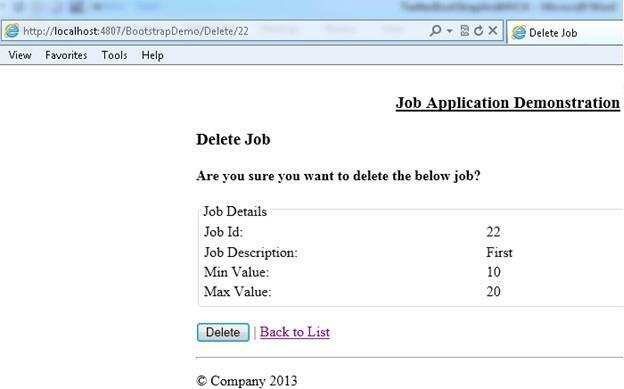 Step#24: Click on Delete link, it will take the user to Delete.cshtml to delete the job. 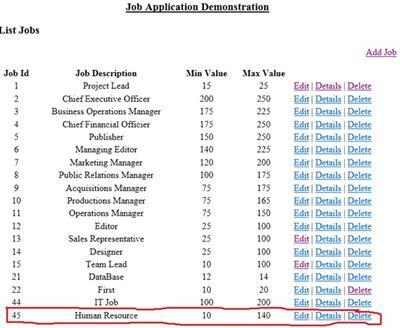 Click on delete will delete the job from the database. The user can edit the records from here as well just by clicking on the Edit link. 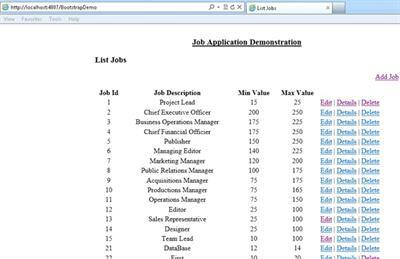 Every view is having the back to list to take the user to the first page where are the jobs are displayed. 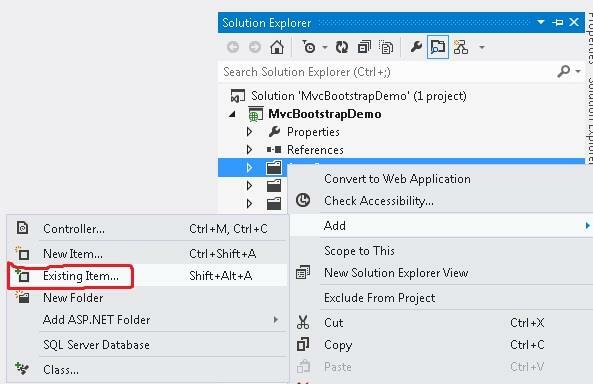 Hope this article will make you understand of how to use the Twitter Bootstrap in our ASP.Net MVC 4 application by using the Visual Studio 2012 as the IDE and Entity Framework 5.